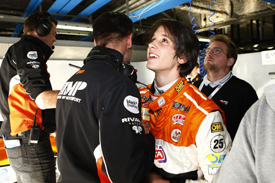 EuroInternational wants to run 2012 Italian Formula 3 champion Riccardo Agostini in next season's F3 European Championship. The 19-year-old Italian raced in Auto GP this season, setting pole position for the opening round, but failed to win a race and dropped out of the series midway through the year. EuroInternational team boss Antonio Ferrari was keen to field Agostini in F3 this season, but instead the parties are working on a deal for 2014. Agostini tested the team's Dallara-Mercedes at Valencia this week, setting lap times putting him among the frontrunners of the F3 European Championship teams present. He could be joined by American Santino Ferrucci, who set the fastest time overall in Thursday's running in EuroInternational's German F3 Cup car, using the series' spec Volkswagen Power Engine - this engine is more powerful than those used in European F3. Karting star Ferrucci, the veteran of just four race starts in Formula 2000 in the US, stole Thursday's bragging rights from Max Verstappen, who topped Wednesday's running. Ferrucci, who completed three days of testing at Vallelunga before heading to Valencia, said: "It's been very fun and interesting. "I didn't expect to be overly fast and it's a bit of a surprise, but I'm glad we went - I wanted to see how I would do at a high level. Now we need to work out what I'm going to do next year." EuroInternational is weighing up Ferrucci for European F3 and for German F3, where the team will switch to Mercedes power as the VW Power Engine has now been outlawed. AUTOSPORT understands that Ferrucci is also eyeing British F3.